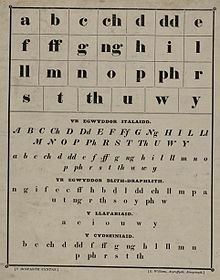 Welsh orthography uses 29 letters (including eight digraphs) of the Latin script to write native Welsh words as well as established loanwords. The acute accent (Welsh: acen ddyrchafedig), the grave accent (Welsh: acen ddisgynedig), the circumflex (Welsh: acen grom, to bach or hirnod) and the diaeresis mark (Welsh: didolnod) are also used on vowels, but accented letters are not regarded as part of the alphabet. The letter j was only relatively recently accepted into Welsh orthography for those words borrowed from English in which the /dʒ/ sound is retained in Welsh, even where that sound is not represented by j in English spelling, as in garej ("garage") and ffrij ("fridge"). Older borrowings of English words containing /dʒ/ resulted in the sound being pronounced and spelt in various other ways, resulting in occasional doublets such as Siapan and Japan ("Japan"). The letters k, q, v, x and z are sometimes used in technical terms, like kilogram, volt and zero, but in all cases can be, and often are, replaced by Welsh letters: cilogram, folt and sero. Nevertheless, in Y Wladfa, the Welsh settlement in Patagonia, v is used generally to represent the sound /v/. The earliest samples of written Welsh date from the 6th century and are in the Latin alphabet (see Old Welsh). The orthography differs from that of modern Welsh, particularly in the use of p, t and c to represent the voiced plosives /b, d, ɡ/ in the middle and at the end of words. Similarly, the voiced fricatives /v, ð/ were written with b and d.
In this period, ð (capitalised as Ð) was also used as a letter, interchangeable with dd, such as the passage in the 1567 New Testament: A Dyw y sych ymaith yr oll ðeigre oddiwrth y llygeid, which contains both ð and dd. Elsewhere, the same word is spelt in different ways, e.g. newydd and newyð. "N" and "S" indicate variants specific to the northern and southern dialects of Welsh. Throughout Wales an alternative system is also in use in which all consonant letters are named using the corresponding consonant sound plus a schwa (e.g. cy /kə/ for èc). In this system the vowels are named as below. ll èll /ɬ/ not present in English; a voiceless alveolar lateral fricative. A bit like what the consonant cluster "hl" would sound like. /ɪ, iː/ (S) for Southern variants: bit (short) / machine (long); in Northern dialects /ɨ̞, ɨː/ not found in English. Identical to "î" and "â" in Romanian, and similar to the "e" in English roses. above (other places, short) / roses /ɨ̞, ɨː/, found in certain dialects of English that differentiate "Rosa's" and "roses", for example, General American. ^ a b c The sequence si indicates /ʃ/ when followed by a vowel; similarly, di and ti sometimes indicate /dʒ/ and /tʃ/ respectively when followed by a vowel, although these sounds are spelled j and ts in loanwords like jẁg "jug" and wats "watch". ^ In addition to representing the phoneme /h/, h indicates voicelessness in the graphemes mh, nh, ngh and rh. The digraph ph – which indicates the aspirate mutation of p (e.g. ei phen-ôl) – may also be found very occasionally in words derived from Greek (e.g. phenol), although most words of Greek origin are spelt with ff (e.g. ffotograff). ^ a b In the North, the letters u and y are occasionally pronounced /ɪ, iː/, the same as in the South, rather than /ɨ̞, ɨː/. This is usually the case when the preceding vowel is /ɪ/ or when y is preceded or followed by g /g/ or followed by w /u/, forming a diphthong. "Morffoleg y Gymraeg". Geiriadur yr Academi. Bangor University. Retrieved 25 July 2014. ^ The vowel letter y indicates /ə/ in unstressed monosyllabic words (e.g. y "the", fy "my") or non-final syllables (regardless of whether these are stressed or not), but /ɨ̞, ɨː/ (N) or /ɪ, iː/ (S) in word-final syllables (again, regardless of stress). Welsh makes use of a number of diacritics. The circumflex (ˆ) is used to mark long vowels, so â, ê, î, ô, û, ŵ, ŷ are always long. However, not all long vowels are marked with a circumflex, so the letters a, e, i, o, u, w, y with no circumflex do not necessarily represent short vowels; see "Predicting vowel length from orthography" below. The grave accent (`) is sometimes used, usually in words borrowed from another language, to mark vowels that are short when a long vowel would normally be expected, e.g. pas /pɑːs/ (a cough), pàs /pas/ (a pass/permit or a lift in a car); mwg /muːɡ/ (smoke), mẁg /mʊɡ/ (a mug). The acute accent (´) is sometimes used to mark a stressed final syllable in a polysyllabic word. Thus the words gwacáu (to empty) and dicléin (decline) have final stress. However, not all polysyllabic words with final stress are marked with the acute accent (Cymraeg "Welsh", for example, is written with none). The acute may also be used to indicate that a letter w represents a vowel where a glide might otherwise be expected, e.g. gẃraidd /ˈɡʊ.raið/ (two syllables) "manly", as opposed to gwraidd /ˈɡʷraið/ (one syllable) "root". Similarly, the diaeresis (¨) is used to indicate that two adjoining vowels are to be pronounced separately, e.g. copïo (to copy) pronounced /kɔˈpiːɔ/, not */ˈkɔpjɔ/. The grave and acute accents in particular are very often omitted in casual writing, and the same is true to a lesser extent of the diaeresis. The circumflex, however, is usually included. Accented vowels are not considered distinct letters for the purpose of collation. As mentioned above, vowels marked with the circumflex are always long, and those marked with the grave accent are always short. If a vowel is not marked with a diacritic, its length must be determined by its environment; the rules vary a bit according to dialect. In all dialects, only stressed vowels may be long; unstressed vowels are always short. in the last syllable of a word when no consonant follows: da /dɑː/ (good). before voiced stops b, d, g and before all fricatives (except for ll) dd, f, ff, th, s: mab /mɑːb/ (son), hoff /hoːf/ (favourite), peth /peːθ/ (thing), nos /noːs/ (night). in an unstressed (proclitic) word: a /a/. before most consonant clusters: sant /sant/ (saint), perth /pɛrθ/ (hedge), Ebrill /ˈɛbrɪɬ/ (April). The vowel y, when it is pronounced /ə/, is always short[contradictory] even when it appears in an environment where other vowels would be long: cyfan (whole) /ˈkəvan/. When pronounced as a close or near-close vowel (/ɨ/ or /ɨ̞/ in the North, /i/ or /ɪ/ in the South), y follows the same rules as other vowels: dydd (day) /ˈdɨːð/ (North) ~ /ˈdiːð/ (South), gwynt (wind) /ˈɡwɨ̞nt/ (North) ~ /ˈɡwɪnt/ (South). Before l, m, n, and r, unmarked vowels are long in some words and short in others: gwin /ɡwiːn/ (wine), prin /prɪn/ (scarcely); hen /heːn/ (old), pen /pɛn/ (head); dyn /dɨːn/ ~ /diːn/ (man), gwyn /ɡwɨ̞n/ ~ /ɡwɪn/ (white); stwmo /ˈstuːmo/ (bank up a fire), amal /ˈamal/ (often); celyn /ˈkeːlɪn/ (holly), calon /ˈkalɔn/ (heart). (The last four examples are given in South Welsh pronunciation only since vowels in nonfinal syllables are always short in North Welsh.) Before nn and rr, vowels are always short: onn /ˈɔn/ (ash trees), ennill /ˈɛnɪɬ/ (to win), carreg /ˈkarɛɡ/ (stone). In Northern dialects, long vowels are stressed and appear in the final syllable of the word. Vowels in non-final syllables are always short. In addition to the rules above, a vowel is long in the North before a consonant cluster beginning with s: tyst /tɨːst/ (witness). Before ll, a vowel is short when no consonant follows the ll: gwell (better) /ɡwɛɬ/ It is long when another consonant does follow the ll: gwallt /ɡwɑːɬt/ (hair). In Southern dialects, long vowels may appear in a stressed penultimate syllable as well as in a stressed word-final syllable. Before ll, a stressed vowel in the last syllable can be either long (e.g. gwell "better" /ɡweːɬ/) or short (e.g. twll "hole" /tʊɬ/). However, a stressed vowel in the penult before ll is always short: dillad /ˈdɪɬad/ (clothes). Before s, a stressed vowel in the last syllable is long, as mentioned above, but a stressed vowel in the penult is short: mesur (measure) /ˈmɛsir/. Vowels are always short before consonant clusters: sant /sant/ (saint), gwallt /ɡwaɬt/ (hair), tyst /tɪst/ (witness). While the digraphs ch, dd, ff, ng, ll, ph, rh, th are each written with two symbols, they are all considered to be single letters. This means, for example that Llanelli (a town in South Wales) is considered to have only six letters in Welsh, compared to eight letters in English. Consequently, they each take up only a single space in Welsh crosswords. Sorting is done in correspondence with the alphabet. For example, la comes before ly, which comes before lla, which comes before ma. Automated sorting may occasionally be complicated by the fact that additional information may be needed to distinguish a genuine digraph from a juxtaposition of letters; for example llom comes after llong (in which the ng stands for /ŋ/) but before llongyfarch (in which n and g are pronounced separately as /ŋɡ/). The status of the digraphs as single letters is reflected in the stylised forms used in the logos of the National Library of Wales (logo) and Cardiff University (logo). ^ "Yr Wyddor Gymraeg/The Welsh Alphabet". Retrieved 4 March 2015. ^ "Alphabets". Retrieved 30 May 2017. ^ a b c Watkins, T. Arwyn (1993) "Welsh" in Ball, Martin J. with Fife, James (Eds) The Celtic Languages. London/New York: Routledge: 289-348. ^ Evans, Simon D. (1964) A Grammar of Middle Welsh. Dublin: ColourBooks Ltd.
^ Testament Newydd (1567) Pen 21 [The 1567 New Testament, Revelation 21] . ^ Thomas, Peter Wynn (1996) Gramadeg y Gymraeg. Cardiff: University of Wales Press: 749. ^ Awbery, Gwenllian M. (1984). "Phonotactic constraints in Welsh". In Ball, Martin J.; Jones, Glyn E. (eds.). Welsh Phonology: Selected Readings. Cardiff: University of Wales Press. pp. 65–104. ISBN 0-7083-0861-9. ^ Morris Jones, J. (1913). A Welsh Grammar, Historical and Comparative . Oxford: Clarendon Press. pp. 11–18, 65–74. This page was last edited on 25 February 2019, at 10:34 (UTC).